We try to do fun stuff at least once a week as a family. 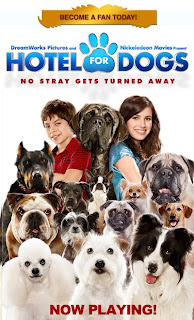 Today we went and saw Hotel for Dogs. It is a good movie. All the kids enjoyed it, especially Mel because she thinks that Jake T. Austin is super HOT!!! All four of the kids said their favorite part was when the foster parents fall into a dumpster full of doggie bags of poop and they say, "We are in deep doo doo". Of course they love the poop parts. I love taking my kids to the movie because they all enjoy it and we always have a good time together, as long as everyone has their own popcorn and soda and no one has to share. It is the one activity that all of us enjoy doing together.